Winter foraging or survival foraging, either way there is food out there regardless of how much snow is on the ground. Before getting into details, it is important to understand that if in a survival situation, getting a sensation of feeling full probably will not happen unless you’re trapping or fishing; and even then, it could take quite some time before you get that first meal. In the meantime your body will be starving for nutrients, which can be obtained from wild edibles that surround us. Our body needs carbohydrates, proteins, fat and other nutrients in order to function properly. Many people are under the impression if they were to trap in order to eat food they will be fine. Yes and no. Many explorers ate a steady diet of rabbit throughout the winter and either suffered severe malnutrition or they starved to death. Rabbits do not have everything our body’s need to survive. Carbohydrates are essential in order to provide fuel for our muscular system, central nervous system, and to our entire body. These carbon-containing, organic compounds are an integral part of both plant and animal life; without these, life as we know it cannot exist. Carbohydrates are made up of three elements: carbon, hydrogen and oxygen. Fats are also comprised of carbon, hydrogen and oxygen, but they contain less oxygen and more carbon and hydrogen than carbohydrates. Along with protein and fats, carbohydrates comprise the major components of living matter and are used for continual maintenance of cellular functional activities. Carbohydrates are the primary source of energy for the animal kingdom. Protein is in every cell, organ and tissue of our body. As our body uses protein, there is an ongoing ‘production line’ that replaces them every day of our life. Proteins we take in are digested into amino acids and it is these that are used to replace proteins in the body. Essential fatty acids (Omega-3, 6 & 9), triglycerides and cholesterol have a positive function in our body. The body is unable to produce these on its own yet they are critical for storing energy, insulating us and protecting our vital organs. Omega-3 is critical to have for proper brain function. Fats also start chemical reactions that help control immune function, growth, reproduction and other aspects of metabolism. Fats help our body to stockpile certain nutrients as well. The “fat-soluble” vitamins (A, D, E and K) are stored in the liver and in fatty tissues. The cycle of making, breaking, storing and mobilizing fats is at the core of how we and all animals regulate their energy. Any imbalance can result in disease including heart disease and diabetes. For example, too many triglycerides in our bloodstream increase the risk of clogged arteries, which can lead to heart attack and stroke. Now that you know the basics of what is necessary to consume to survive, what is there in the middle of winter? I am not going to get into depth here, but I urge you to do further research. This article is not enough and therefore you must continue to research. I will offer the basics, and for in-depth information you must investigate on your own. First one is simple. Dr. Hansteen was the chief lecturer in the Agricultural School at Aas, Norway in 1911. He prophesized that lichen would become a popular food source due to its nutritive properties, and the fact that it is free. Lichens are an incredible source of carbohydrates, in fact too much. I will explain in a moment. There are almost 20,000 lichens worldwide and from all the books I have read there are a guaranteed two that will cause death. Letharia vulpine (Wolf lichen) and Vulpicida pinastri (Powdered Sunshine lichen) are a must to identify and never touch; these two are without a doubt poisonous. (There are inevitably others depending where on this planet you live. Therefore it is critical to research lichen in your area.) A rule to follow is that if you discover any lichen that is yellow or has any trace of yellow in it – do not harvest it unless you know what specific lichen it is. Now, this does not mean that the other 19,000+ types of lichens are good to eat – they are not. Many contain high concentrations of acid that when ingested, your stomach will be in great agony. 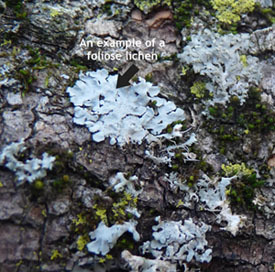 Any lichen that is edible MUST be boiled in order to reduce or eliminate acid content. The acid content will vary from species-to-species. The Cladonias are the most nutritious and the least acidic. A combination of nutritional studies indicate that these lichen are a great source of protein, fiber, fat, carbohydrates, and they also contain vitamin A, niacin, calcium, iron, phosphorus. In fact, results from a 1956 study by B.M. Lal and K. Ranganatha Rao found that the calcium and iron levels to be higher in lichens than in cereals and many green, leafy plants. They discovered that the calcium to phosphorus ratio was 2:14; and this showed that lichens could serve as a good source of calcium. Peltigera canina has been found to be relatively high in protein and essential amino acids. Without a doubt, lichens are valuable as survival food so long as you know what ones to avoid and to be sure that what you collect is boiled to remove the acids that can cause the stomach a lot of grief. Winter Survival Food (Part 2) will be posted no later than February 22, 2013. Karen I was at your walk on the weekend and you are incredible – not only do you know what you are talking about you speak in a way no one wanted to miss a word. Your passion ignites passion in others. Thanks.Great article too – cant wait to see part 2! Very interesting, I had never heard of eating lichens before. I will definitely be looking more into that.